When it comes to saving money on gas, you’ve probably tried everything you can think of. And with gas prices still fluctuating daily, it’s no wonder that you’re trying to lower your fuel consumption! But have you tried talking to your auto repair mechanic in Tacoma, WA about it yet? Your auto repair mechanic is supposed to be there to help you with all of your auto repair services in Tacoma, WA – including your automobile’s fuel efficiency. As it turns out, there are several auto repair and auto maintenance services that your mechanic can help you with to save you gas money! Keep good tires on your vehicle. Having properly inflated tires with good tread is vital. Tires that are worn-out or underinflated are wasteful, requiring more gas to propel them forward. Replace your air filter. Many people don’t realize that their car’s air filter is directly related to its gas consumption, but an air filter that is clogged with dirt, dust and bugs can reduce your gas mileage by up to 10%! Check your spark plugs. A bad spark plug reduces your car’s fuel efficiency by up to 30%! Keep up with your oil changes. Make sure you get your oil changed. Having old or dirty motor oil running through your engine makes your engine work harder. And the harder you engine works, the more gas you burn. Get an engine tune-up. An engine tune-up is a great auto repair service in Tacoma as it increases your car’s overall fuel efficiency and keeps your engine running better, longer. Keep up with your auto maintenance services. The best way to increase your vehicle’s fuel efficiency is to keep up with its factory-scheduled auto maintenance services. Don’t put off taking care of your vehicle! Next time you find yourself needing auto repair in Tacoma, WA, make sure you remember to talk with your reliable auto repair mechanic about how they can help your automobile run better and save you money on gas. 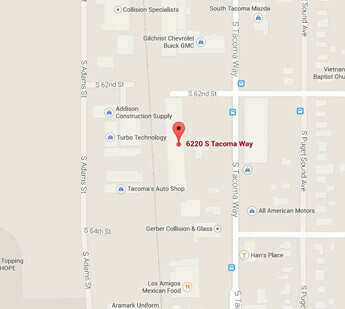 Your Tacoma auto mechanic will be happy to help – and you’ll be extremely happy they did!